Students walking through Speaker’s Circle Tuesday morning were in for a treat: free hot chocolate and a spontaneous dance party. 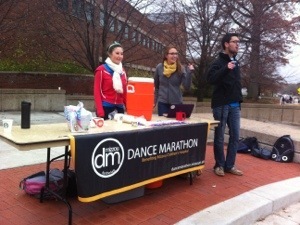 Dance Marathon, a philanthropy that fundraiser for the MU Children’s Hospital, distributed hot chocolate from 8 a.m. to 2 p.m. They also set up a chalkboard for dancers to write why they participate. Jessica Miller, an MU student and education major, wrote “because of my future classroom.” She was enthusiastic about the morning’s event. Miller credits the event’s success to the group’s energy. For more information on Dance Marathon visit dancemarathon.missouri.edu. 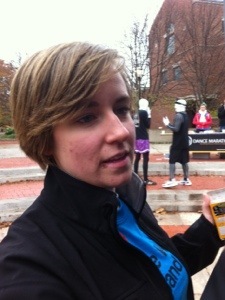 Maggie Rotts, Lauren Sines and Tucker Moore hand out free hot chocolate on behalf of Dance Marathon in Speaker’s Circle on Tuesday Nov. 6, 2012. Jess Miller signs the chalkboard in Speaker’s Circle on Tuesday Nov. 6, 2012. 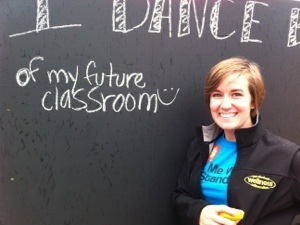 Jess Miller, an education major at MU, poses next to her inscription on the chalkboard in Speaker’s Circle on Tuesday Nov. 6, 2012.